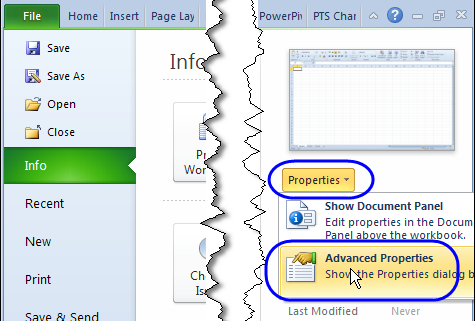 How to change a property setting in Excel, so you can see Excel Preview pictures when opening files. 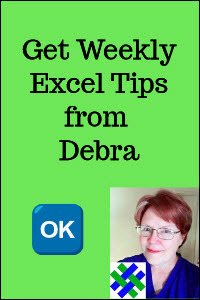 These instructions are for Excel 2003, Excel 2007 and Excel 2010. 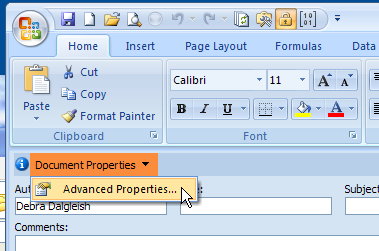 For later versions of Excel, see Picture Preview - Excel 2016. 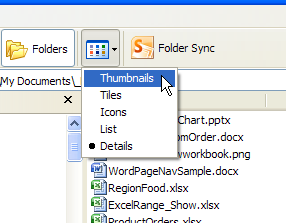 When you're opening files in Excel, you can see a list of files in the selected folder. There are a few options for viewing the list, including Details, List and Preview. 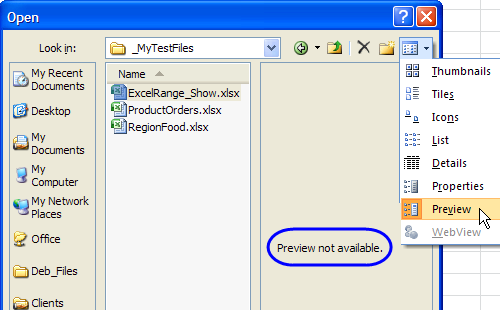 Usually, if you click on an Excel file, while using the Preview option, a message appears -- "No Preview Available." 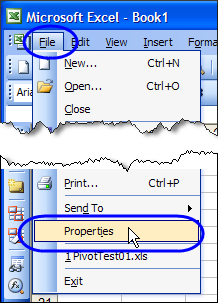 This article explains how to change one of the property settings in a file, so you can see its Preview picture, when opening files. To see the steps for turning on the Preview Picture setting in Excel 2010, you can watch this short Excel video tutorial. 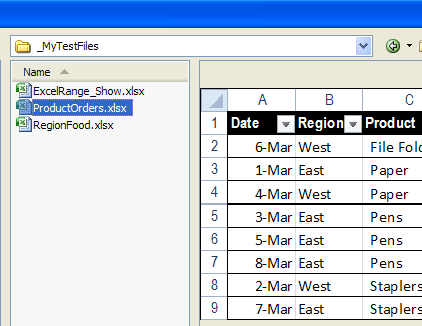 Written instructions for Excel 2010, Excel 2007 and Excel 2003 are shown below the video. 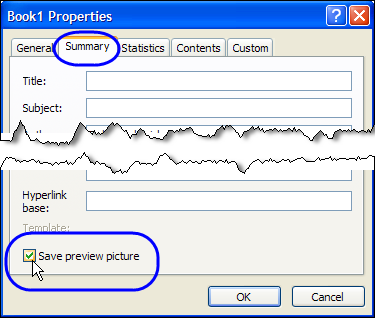 The first step in changing the Preview Picture setting is to open the Properties dialog box. The following instructions are for Excel 2010, and there are instructions for Excel 2007 and Excel 2003 in the sections below. After the Preview Picture setting is turned on for an Excel file, you can see its picture in Excel's Open window, while using the Preview option. 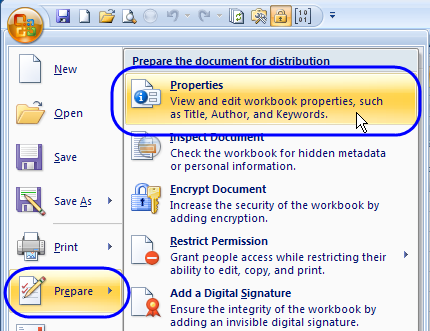 NOTE: The preview shows the worksheet that was active when the Excel file was last saved. You can also see the preview picture in Windows Explorer, if you select the Thumbnail view. 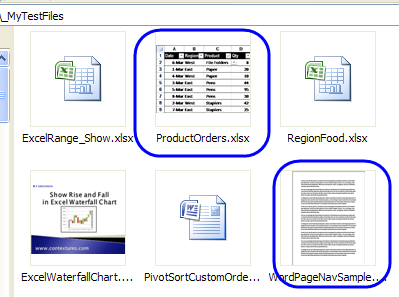 In the screen shot below, you can see the thumbnails for Excel files and Word files, in which the Preview Picture setting has been turned on. For the other files, without that setting turned on, the normal icon for the application is showing.